The population of the planet is increasing rapidly. It hasn't always been this way. Look at the graph below and you'll notice that the population of humans on the planet was increasingly at a much lower rate until approximately 100 years ago. We currently employ a range of techniques to maximise the yield from our crops to produce as much food as possible from the available land. These include the use of fertilisers and pesticides and increasingly genetic modification. The approaches used in modern farming to maximise yields is often referred to as intensive farming. These techniques are explored in more detail below, including the effects they have on the environment. As previously discussed, plants require nitrogen in the form of nitrates in order to produce proteins for growth. 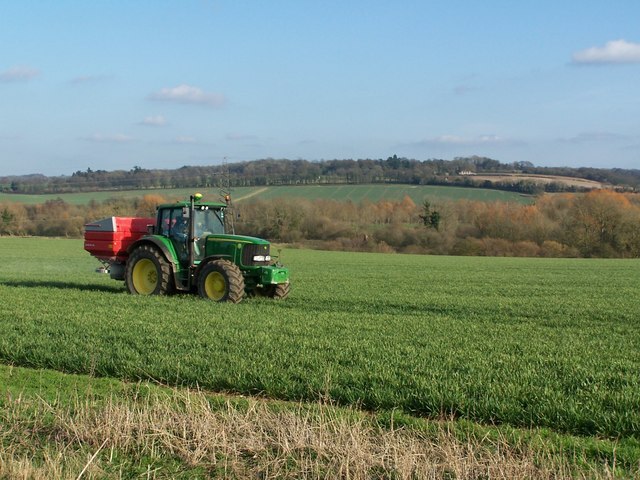 Fertilisers contain nitrogen in the form of nitrates, as well as other nutrients needed for plant growth such as potassium and phosphorous. One way for farmers therefore to increase yield is to apply fertilisers to their crops. If however fertiliser leach from the fields they were applied into to fresh water ecosystems such as rivers or lakes, algal blooms can occur. This is because microscopic algae will grow more rapidly with the increase in nutrient availability supplied by the fertilisers. This explosion in algae blocks the light to the other plants in the ecosystem causing them to die. Bacteria then decompose these dead plants which uses up the dissolved oxygen in the water, ultimately causing the death of any animals living in the ecosystem such as fish. Pesticides are chemicals which are sprayed onto crops to kill other organisms. This can include killing insects which would eat the crops, or other plants which would compete with the crops. Pesticides are another common method in modern agriculture which aims to increase yield through reducing the proportion of crops which are lost to pests. Some pesticides sprayed onto crops can accumulate in the bodies of animals over time. As they are passed along food chains, toxicity increases and can reach fatal levels. One example of this is DDT. DDT was a pesticide which was used widely in the mid-Twentieth Century before its ability to accumulate in the tissues of organisms was discovered. One important way in which we can determine whether or not we are polluting an ecosystem is the use of indicator species. Indicator species are species that by their presence or absence indicate environmental quality or levels of pollution. In order to avoid the pollutant effects of pesticides, farmers can choose to use alternatives such as Biological Control and Genetic Modification. Biological Control involves deliberately adding a predator or parasite which kills the pest which is damaging the crops. For example, rather than spraying a pesticide to kill aphids, farmers can instead introduce ladybirds which are predators of aphids. An increasingly common alternative to the spraying of chemicals in intensive farming is genetic modification. This involves the alteration of the genome of the crop plant which results in the crop producing the chemical, such as a pesticide, rather than having to spray it onto the growing crops. GM crops are explained in the video below. The image below demonstrates the rapid adoption in the use of GM crops in the US. GM crops in the UK however are still very controversial.